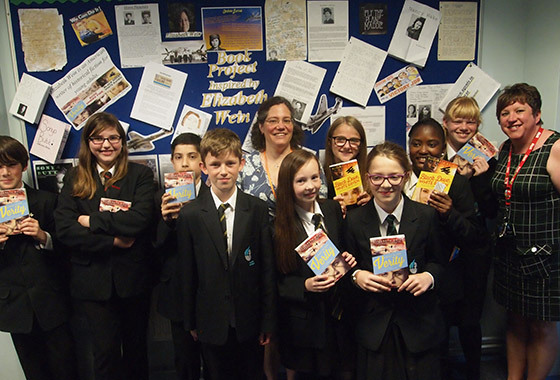 This June we took Carnegie Shortlisted author, Elizabeth Wein on tour. 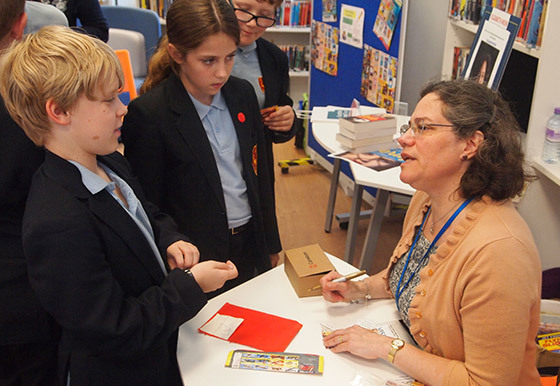 Elizabeth is the author of three brilliant books for teenagers each featuring female pilots in wartime. Her first book, Code Name Verity was shortlisted for the Carnegie in 2013 and her most recent book Black Dove, White Raven was shortlisted for the Scottish Children’s Book Awards 2016. Armed only with a selection of Ordnance Survey maps from the early 90s and a boot full of books we set off along the back roads of Norfolk to inspire teenage pupils in some of the most remote areas of the country! Over the course of the week Elizabeth delivered a series of fascinating historical workshops to almost 400 pupils from 12 schools including one event as part of UEA’s brilliant FLY festival. A. Laura Ingalls Wilder – author of the Little House books about pioneer life in the American West, and a character in her own books. She would have so much to tell, and judging by her books she is also a very good cook! A. The Long Winter by Laura Ingalls Wilder. It’s a survival thriller and it’s mostly based on fact. It gives an amazing insight into the determination and ingenuity of people living on the edge of the wilderness under terrible conditions. A. I would love to be a simultaneous translator. I’ve watched them at work and it’s a challenging, rewarding, social job – you have to listen to one thing and say another, in a different language, at the same time. Live translation into sign language would maybe be even better! A. My grandmother’s summer cottage in the forest in Pennsylvania. Her grandfather bought it in 1926 and it’s been my family’s gathering place for ninety years. My grandmother lived there from 1991 until her death last year, when my aunts and I inherited the cottage. It’s still our family gathering place. A. I’m thinking Vivien Leigh, the star of Gone With the Wind… When I was 20, watching her as Scarlett O’Hara, I realised we had the same green eyes. It was a moment that actually changed the way I dress – I went out and bought my first green sweater the next day. Vanity! A. I asked my brother this question, to remind me, and he answered immediately, “Jamaica.” We lived in Jamaica for three years when we were in primary school. So here’s a memory that’s hard to beat: we used to spend our holidays at a Victorian house that sat on its own private beach. There was no electricity – the house was lit by oil lamps. The loft where we slept had a staircase that went straight down onto the sand. There was a private dock and a pond with three sea turtles living in it which I believe are still alive! It was a wonderful holiday spot! A. I wouldn’t go very far back – I think it would have been incredible to have been born fifty years earlier and to live through the 20th century. Think about the changes that happened in the world over that time – from early radio to satellite communication – from the early days of flight to jet travel – and all the social and cultural events that shaped the world in between. I’d like to have been an adult during the Civil Rights Movement rather than a tiny child, and to have been able to understand what was going on and to participate. A. The Owl Service by Alan Garner. In addition to changing the way I think about plot and dialogue, it introduced me to the medieval Welsh tales of The Mabinogion, which have deeply influenced my own writing. A. Write about something you’re passionate about! Your own enthusiasm for your subject matter will shine through and help to make your writing interesting for others. A. It would be nice to own a little plane… Just a little one, a single-engined four seater, that we could keep nearby and fly around Scotland!